This time of year, Mother Nature isn't the only one out there creating works of art. The last weekend in September is the traditional date for the local Artists' Studio Tour. While some of the studios will be displaying only the work of that craftsperson, many of the local artists will share studio space, so you can see the works of several artists at one location. We have so many brilliant artists here in North Muskoka -- drawn by the beauty of the area. That can't be said for most of the current day artists up here. We have artwork created by our friends and neighbours, ranging from the fabulous life-size bronze sculpture of a red tail hawk in full flight created by Brenda Wainman Goulet (who also crafted the Tom Thompson statue in Huntsville), watercolours, acrylics, paintings on wood, carvings, glass work... 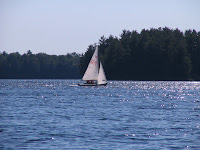 There is truly something for everyone in the studios around the Lake of Bays. You can join the tour at any studio, and pick up a map to the rest of the tour. There's no charge -- but be prepared to whip out your Visa when you see the art on offer. 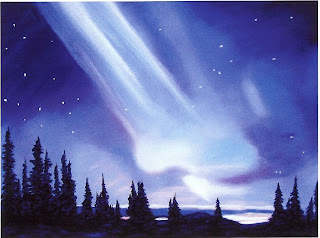 This depiction of the Aurora Borealis is the work of Janet Stahle-Fraser, at Tapawingo Gallery in Baysville. Janet works in a wide variety of media, and Nancy has samples of her artwork dotted through her own house and the cottages. She has one of the studios you don't want to miss. 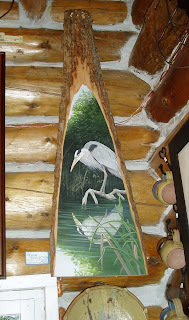 The painting on basswood of the heron is the work of Lynn Norris. Nancy has an owl painted by Lynn that sits in her office and watches her type. This heron is for sale at the Oxtongue Craft Cabin. These are just two of the artists open for the tour. You should be there... the creative spirit is alive and well in Muskoka... and it will lift your spirits too! We have a lot of lovely autumn weather still to come... and then there will be Indian Summer... and that will take us through until close to the time we need to consider hanging up the Christmas decorations. Autumn is for fall fairs, harvest, long walks in the fallen leaves. A time to take a breath, watch the sky for Northern Lights. But just around the corner there is always another season. Winter in the city is not so good... but up here, where a happy conjunction of altitude and latitude provide us with the kind of snow you can PLAY with, winter is beautiful. Brian has been hard at work on our cross country ski trails, cutting and clearing brush, smoothing out any rough spots. Preparing for the snow -- even though it's a long way off, and we've still got Thanksgiving to come first!! Still, now is a good time to remember how much fun winter can be, and plan a snow holiday. We are close to alpine ski hills, tubing centres, and we offer snowshoe trails as well as ski trails here at Bondi. Toboganning, tubing hills, and a great excuse to come back inside, curl up by the fire and watch wildlife through a window! There is a magical quality of light in the early evenings this time of year. A softness, and a stillness. We get the best sunsets through the fall. With the colour coming into the trees, the sunset lighting up the sky, and the reflections in the lake, it is breathtakingly lovely out there. This has to be among the best times of the year to go hiking, or just go for a drive and admire the scenery. But be sure to be back at the cottage in time to watch the sun go down over the lake, and paint it's pictures for you to enjoy. It begins in the spring, with the young bucks coming onto the lawn with their antlers just beginning to show. 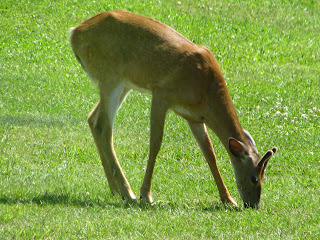 Gradually, they get bigger, covered with thick velvet, like this young gentleman grazing near one of the cottages. About this time of year, however, the bucks are getting ready for the mating season, and the first rule of that game is to have the antlers polished up and looking good. This is our same young buck, up by the basketball court, filling his tummy with crabapples, and showing off his antlers for the girls. And for us. Syl and Kelly spent a week with us in early September. We tackled the problem by making apple sauce, and tucking it into the freezer for a taste of autumn on a cold winter's day. Syl, however, seized the opportunity, and crafted apple pies. We think he should have stayed a little longer -- after all, there is a class at the local Huntsville Fall Fair for home baked goods. And these pies... they've got 'first place' written all over them! As the nights get colder, and we start to cover up the tomatoes at night, the colours on the trees get stronger. We have certain trees that we use as our 'indicator' trees -- they always seem to be the very first to change their colours. 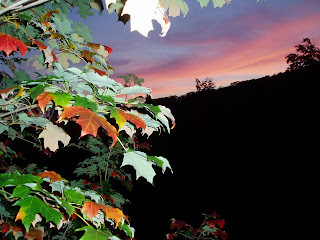 According the them, this will be an exceptionally good year for leaf watchers, here in north Muskoka! Early mornings, with colour hinting through the mists are special times. Mid-day, the colours change tone as well. And sometimes, just the way the yardlight hits the branches at night can make a person stop, and smile. Holly will be 16 on November 2nd. 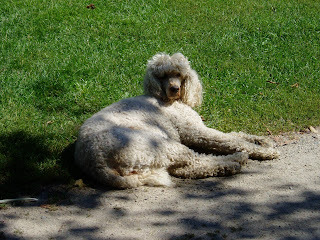 That's quite an age for a standard poodle. She has been the perfect resort dog for all those years. This summer she had to spend a lot of time wearing a cone on her head -- what's called a Buster Collar. That was so she would stop worrying at a fly bite on her leg -- we can relate to how itchy those can be! 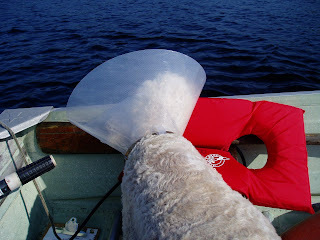 She wore her collar with stoic indifference, even when she was 'helping' out in the support boat for the Island swim. We joked that when she held her head just right, she could pick up transmissions from the CBC... and that she could hire herself out to the SETI project. Holly took all that teasing with good grace. While much of the summer was 'coneless', lots of it involved wearing the cone at least part time. This summer, her cone was completely covered with signatures and 'get well' wishes. 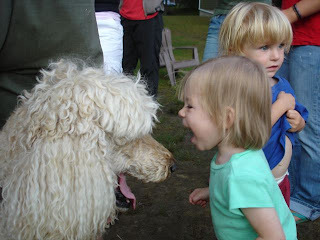 Out of the collar, she shared a joke with Esmee -- one of our favourite photos of all time! She's happy to report to all her firends that she is now officially CONE FREE -- and with fly season well behind us, we're hoping she can stay that way! Although she is slowing down, she still loves going for slow walks in the woods, and just hanging out with our guests, enjoying the company. Dave has been coming to Bondi for more years than he'll let us admit to. And he never arrives without his swimsuit. 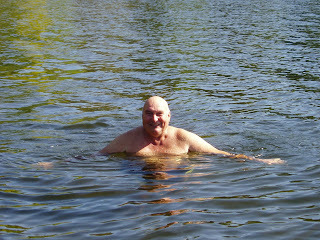 It might be mid-September, but Dave will tell you, "Come on In, The Water's Fine!" It is too. Dave spent over half an hour in the lake. That's half an hour without his cell phone... and that's a good thing. Hooray for Wet People Cheering! 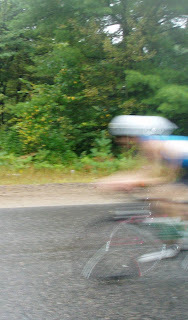 One of the competitors in the Muskoka Ironman 70.3 hollered this back to Dave and Carol, who were at the end of the Fox Point Road, slightly damp, cheering for the cyclists. There was quite a little crowd out there at the 20 km. mark. We had a sign out to cheer the athletes, but it was probably blocked by specators -- and they were cheering enough to more than make up for that! There were people out at the ends of driveways, clustered at road junctions and all the way long the route, despite the overcast and sometimes rainy weather. Nobody's spirits were dampened. 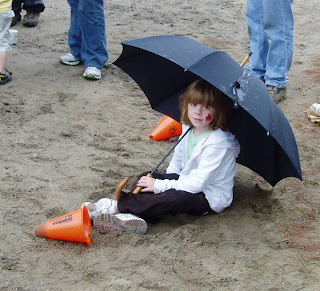 Ashley took refuge under Dad's umbrella at Dwight, but was glad to be there watching. Her class wrote to one of the athletes last spring, as a pen pal exercise, which we think is an inspired way to get the community connected.It's always more fun when you've got someone you know to cheer for! Congratulations on a great job to all the volunteers who turned out in droves -- be it to staff the water stations, direct traffic or paint the kids' faces. You are the cogs that make the wheels turn. Congratulations to all the athletes, in all the categories. 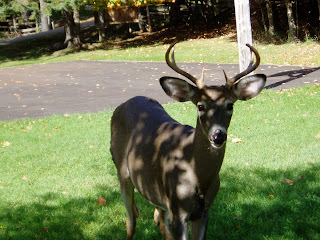 We were delighted to see you here in the Lake of Bays, and are looking forward to your return next year. 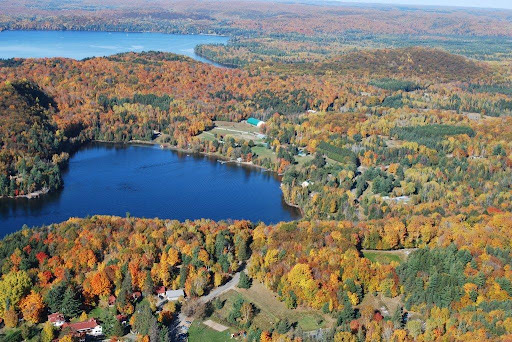 Now that you've seen the lay of the land, we're sure you've discovered that in addition to the big hosting resorts and the Huntsville motels, there are plenty of smaller resorts around the Lake of Bays that would be ideal bases for training camps, support people, families and athletes. Down the Fox Point Road, our resort, BONDI VILLAGE, and FOXWOOD INN offer housekeeping cottages. Along South Portage Road, you bike right past the door of BEAUVIEW. And of course Dwight Beach is the home of LOGGING CHAIN LODGE. COLONIAL BAY is just up Hwy 60, enroute to Huntsville. 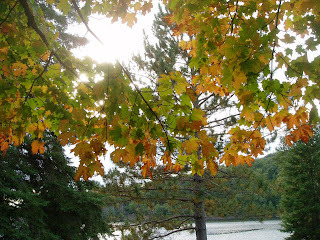 There are also plenty of motels out here, and resorts offering meal plans as well -- check us out at www.northmuskoka.com. It's a little shameless self promotion, but -- to be really honest -- we'd all love to host some of the athletes to promote that community connection to this race that makes it so very special. It's a great way to get to know some of you -- and we don't see why Huntsville should have all that fun :) We'd like to meet you too! Mr. Woodpecker, what's on your mind? We have a lot of wild cherry trees around the property, and every year, about now when the fruit is ripe, we get a lot of birds showing up to feast. The lovely cedar waxwings come in flocks. There is always a bluejay. And, flying a swooping course and shouting 'kwik! kwik! kwik!' come the pileated woodpeckers. These are big birds. Taller than the chickens, but skinnier, dressed in their best black with a bright red crest. When they hammer into a tree, they really make the chips fly. Quinn is standing by a pileated woodpecker tree -- we suspect the bird was trying to create a dug-out canoe, just in case the lake levels rose. 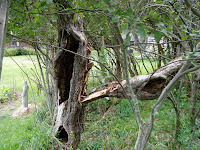 We've seen them hollow out dead trees to such a degree that the trunks snap. But back to the cherry trees, which provide a welcome addition to a diet you have to hammer out of the tree with your beak! The only problem arises when the fruit on the branch begins -- as fruit tends to do -- to ferment. And yes, you can sometimes get tipsy birds, weaving flight paths that would cause them to lose their license. But mostly, what you get is the greatest possible viewing opportunity to watch these incredible birds, and ponder why it is they don't knock themselves unconscious every time they go out to drill for lunch. Among the many adaptations Mother Nature has made to prevent concussion is the woodpecker's tongue. Very long, with a barbed sticky end, it is ideal for extending into the drilled holes, plucking insects out of dead wood. It is also ideal for helping to absorb shock. How? Well, that big long tongue has to be stored somewhere -- the throat area is much to narrow, so the tongue exits through a small hole at the base of the skull, wraps over top of the skull casing, and anchors into the eye socket at the front. That nice spongy tongue helps to take up the shock of hitting a tree with the beak. Nancy worked with the Canadian National Paralympic Dressage Team for five years as National Coach. It was an inspiring position, and she'd be there still, if she could, but it requires too much time away from work, and too much travel to be feasible for her just now, so she has to watch the team from the sidelines these days. But what a view! Lauren Barwick, from BC, is one of our para-athletes. Nancy worked with Lauren at the European Championships in Portugal a few years back, and has tremendous admiration for this young lady. Paralympians are 'graded' into four categories, with Grade I being the most disabled, and Grade IV being the least. Lauren is a Grade II. Don't let that little word 'disabled' fool you, however. These athletes can ride the pants off most of the 'abled' riders you're going to meet at an equivalent level. The Paralympic Standard is excrutiatingly high. Lauren was injured in a freak accident when a bale of hay fell on her head at her home stable in BC, and that horrible day launched her on the path to becoming one of our elite Paralympic athletes. With tremendous focus, stamina, willpower and desire, Lauren followed her chosen path, and proved again and again that there is no "Dis" in "Ability". We're absolutely thrilled to report that in Hong Kong, the venue for the Paralympic Equestrian competition, Lauren won Silver in the Individual dressage test -- and followed that up with GOLD in the musical freestyle (Kur). To get close to the medals at these Games is an enormous accomplishment. To beat out the big powerhouse nations, such as Great Britain, is breathtaking. To win GOLD and SILVER, for herself and for Canada... well, Lauren... YOU ROCK!!! Hopefully there will be some media coverage -- next Saturday we're told there's a short program on CBC. Too bad -- because more folks should see just how incredibly 'able' these athletes, in all their varied sports, are. They are an inspiration to us all, and deserve the same kind of extensive coverage afforded to the 'main Games'. We're so proud of you Lauren!!!! 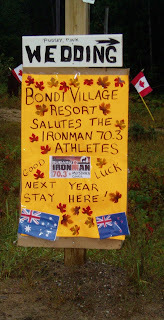 The athletes are rolling into Huntsville and the area for the Ironman 70.3 that takes place this Sunday. Saturday, in Huntsville, the main street will be closed for the Ironman Festival, an open street celebration with entertainment, special sales, and food. The Terry Fox Run will also be held that day, so there's plenty to do. There is even an Athletes' Forum at the Algonquin Theatre from 11 a.m., where you can drop by and talk to some of the competitors about how they train, what they eat, etc. There's nothing like the personal touch to make an event like this more interesting to the general public, and getting to know some of the athletes is the best way to do this. On Sunday, the bike portion of the race comes around Lake of Bays. While the athletes will be working hard, we hope they'll have a moment or two to admire the view. This course really is spectacular. There are a ton of volunteers working to provide the water stations, ensure the roads are clear of debris, and generally assit the competitors towards a smooth competition. The roads are OPEN, so motorists are asked to use EXTREME CAUTION when encountering or overtaking the bikers. Give them lots of room, please! Some of the competitors have brought their families along, and are making it a bit of a vacation. Next year, we hope they'll consider staying here with us. We've got a brilliant base from which to train, and can offer a true Muskoka lakeside experience, complete with our dark skies programs, wolf howls, and our own organic garden to help them 'eat healthy'. 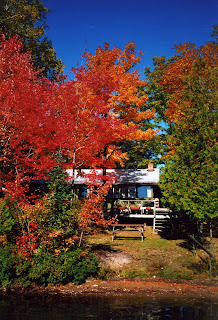 We're close to the action, to Huntsville and Algonquin Park, yet far enough out to ensure a quiet, restful location. 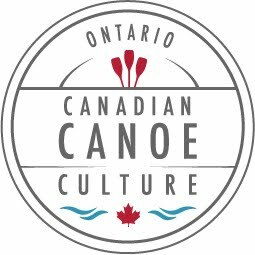 Best of luck to the competitors, and our best wishes for a safe, exciting day of competition here in God's Own Country, Muskoka! Ed sent us this photo, taken on his holiday here in August. 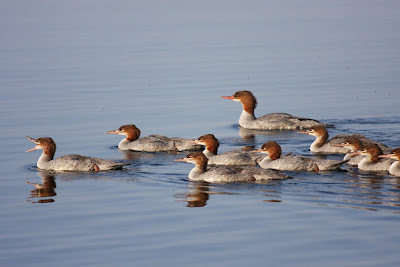 While Nancy did her best to get photos of the mergansers, dashing light footed along the shore snapping away madly while the young ducks fished in the shallows, Ed simply paddled out in his canoe, and the whole flock sailed right beside him. You can see "mom", in the back, shepherding her unruly brood along. You can almost see the sharp, toothlike edges on the bill of the noisy youngster leading the parade -- he actually CAN see the hook at the tip of the bill. These ducks are also known as sheldrakes, or sawbill, because of this beak design. It works very well for fishing! Not for these ducks, however. To have such a large flock -- there were 36 of them here in July! -- there must be fish in these waters! It's a little quieter on the lawns after Labour Day. The wild turkeys take advantage of that... 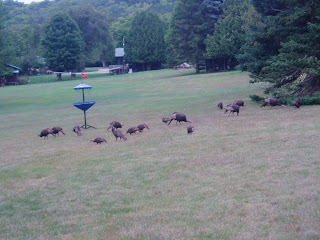 This flock was congregated around one of the Frisbee Golf targets (perhaps turkeys don't like waiting for a tee time?) by Longside cottage. At this time of year, the young poults are just mastering flight. Which, for a turkey, is a project fraught with peril. When it comes to aerodynamics, turkeys are pretty low on the perch, although they do fly... and every night will fly up into roost trees, settling on the branches like some weird fruit. When they descend in the morning, it can be unnerving, since when one decides to jump off the branch, they all follow suit. If you happen to be near the roost tree when this happens, the sky suddenly rains turkeys. 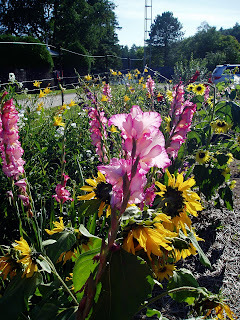 They are shy and wily creatures, and we didn't see much of them over the summer. Every hike in the bush, or through the back field, yielded a small collection of turkey feathers, however, so we knew they weren't far away. 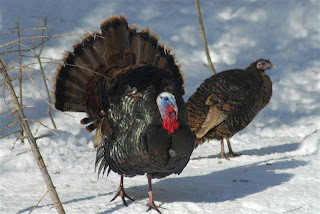 Back in the spring, however, when romance was in the air and the tom turkeys were in full breeding plumage, we would hear them gobbling in the woods. A friend of ours snapped this incredible photo of a pair -- the tom valiantly trying to attract the hen's attention. Turkeys like our back fields, which are full of fruit and seeds and great things for turkeys to eat. And we are fond of our wild turkeys, even if they do like to sneak down and intimidate the chickens, stealing all their grain. Turkeys were re-introduced into southern Ontario some twenty years ago, and have made quite a come-back. Winters were considered to be too harsh for them to survive this far north, but so far, global warming has been on their side. 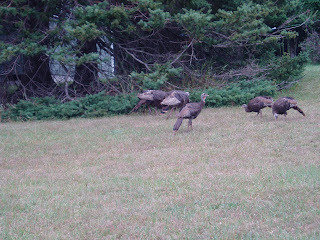 An interesting aside is that we (Ontario) got the wild turkeys from Michigan. In exchange, we gave them moose, harvested live in Algonquin Park, and transported to the panhandle of the State to rebuild the moose population there. Those transplanted moose are doing very well. It has been said that this exchange was NAFTA in a nutshell -- we gave them moose... they gave us turkeys... but let us not go there! Nancy drove to Belleville on the Labour Day weekend -- she was judging at the Ontario Horse Trials Championships, and decided it was better to arrive Friday evening rather than try to drive there and back on Saturday! This put her in Algonquin Park just before dusk -- and one should always drive Algonquin with eyes wide open. A gathering of cars and people along the shoulder of the road in the Park signifies one thing, and one thing only. MOOSE. Let us add this is the best way to see them, on the shoulder of the road, rather than on the road in front of you! 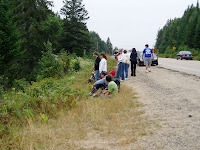 This very typical collection of people settled in on the roadside is one of the classic Algonquin Park Road signs. And yes, they were all watching a moose. One of our guests snapped this shot of a moose in the Park in the spring (obviously -- he still has his great rack in velvet. This time of year, they're polishing those up and getting ready for the breeding season) But this moose, too, had a roadside audience. 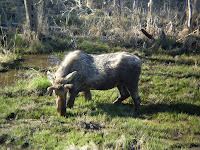 In April and May you are virtually guaranteed to see a moose driving through the Park. This time of year, it's still an excellent chance. And with the colour coming on the trees, even if you don't see Bullwinkle, you'll still get an eyeful of scenery that makes the drive something special. And if you see cars parked along the shoulder... slow down. Those folks are looking at the moose, not at the traffic! Down to the Sea in Ship. 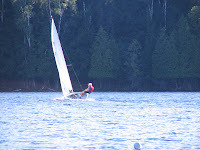 Nancy tried very hard to get photos of Tom and his indefatigable crew while they were here in late August sailing past. But no matter how she tried, her pictures were blurred -- perhaps by the speed of the passage? Blinded by the glory of this ship under full sail? The sometimes tricky winds we get here in Bondi Bay? Who knows? It is a matter of pride to Tom that at least once a summer 'Windbreaker' rolls over in the bay. Nancy wasn't even able to capture that moment -- the boys described her photojournalism efforts in this area an "epic fail." Luckily, Tom has been kind enough to send some photos, and the following letter, which we think says it all. Thanks Tom, and all the Windbreaker crew! "I am attaching some pictures of the majestic yacht "WindBreaker" under sail. They were provided by Boris and Sunny.Sunny was the photographer, Boris was the willing crew. 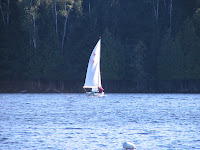 I believe strongly that the boat glides through the water better on Lake of Bays than anywhere else we have been. I also believes it makes a better sound but my family has asked me not to say that out loud. The general agreement was that it may have been the finest two weeks we have had at your place, which is saying a lot. Weather was fantastic, water was supreme, great winds, clear starry skies, howling wolves, amazing baked goods and most important some truly wonderful friends. Thanks for inviting us back, Tom"
Tom, Leslie, and the gang, seeing you here helps MAKE the summer for us! We always look forward to your visits. 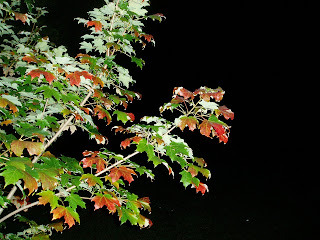 By late August the trees are starting to put on their autumn glory of colour. Since we've had plenty of moisture in the ground this year, the trees have had a good summer -- there has not been the drought stress that can often trigger the leaves into changing early, and this year, all seems to be on schedule. There are few things on this planet more beautiful than the changing of the leaves in Muskoka. If you've never experienced this, you really should add it to your "bucket list". 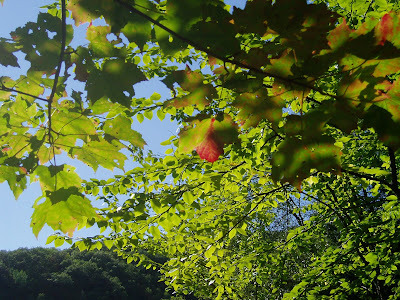 This picture was taken September 1st, a maple by the lake, still in glorious green, but just getting out the paintbrush to start transforming itself into a blaze of red. I like to walk by it every day, just to see how it's getting along with the artwork. While the sugar maples turn a brilliant red, the red maples take on a crimson hue, aspens go golden, and the oaks go a glorious shade of russet brown. Interspersed are the evergreens, in various shades of greenery, and the tamarack, who likes to take on a vivid yellow. Birds in a Nest... and out of it. We rescue birds all year round. 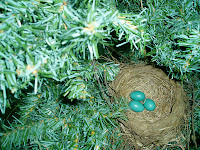 In the spring, there will be robins who have vaulted boldly from the nest just a little too soon. They need to be stuffed gently back into the nest before they have a close enocunter with Achmed the cat. Some are very determined, and will vault back out as fast as you stuff them back in in. 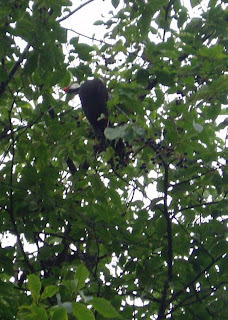 For those, we use an old laundry basket, tied into the tree below the nest. The fledglings can hang out in there until they are strong enough to make their way. 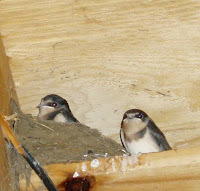 In July, the barn swallows decamp from the nest. They can't steer, so it is important to get out of the way as they come shrieking through the aisle. By the second or third flight, they've got the ailerons working, and can steer well enough to not be a risk to life and limb. Every now and then, one of them requires a laundry basket as well. And we hang up a blanket so they can't see the cat (or the cat see them) from his high perch en route to the hay loft. This August, one of our guests, Wendy, rescued a young cedar waxwing. These lovely birds come to the resort in droves because we have some huge old chokecherry trees. Waxwings, pileated woodpeckers, blue jays -- all love to gorge on the fruit. Which is fine, except that -- like all fruit -- it can ferment. Drinking and flying don't mix, and we sometimes see pretty bizarre flight patterns. This juvenile waxwing spent some time sleeping quietly in Wendy's designer luggage before taking a deep breath and flying away. Sometimes, however, we need back-up. One winter David found a bluejay that had flown into a wire. It couldn't sit upright, but otherwise seemed fine. This spring it was a young robin, for whom we couldn't find parents, or nest. With these, it's off to the marvellous bird sanctuary located near Huntsville. A Wing and a Prayer, run by Janice and Michael Enright relies on donations to keep running. They take in incredible numbers of injured or 'lost' birds, rehabilitating most of them to be released back into the wild. 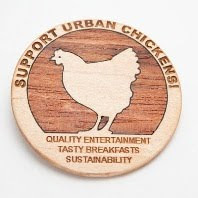 This year alone, they have helped 400 birds. They are famous for the work they have done with loons -- pictures of Michael canoeing with Ebony the loon as he taught her how to hunt for herself in the early morning mist, the bird following the canoe, are etched into my memory. Ebony Young was the first loon chick known to be successfully rehabilitated in North America. So, when we can't handle the situation, or if we need advice, we holler for A Wing and Prayer. 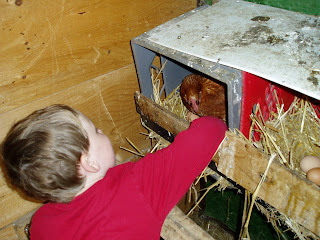 Nancy sticks a donation in an envelope on the box, and the bird is delivered to welcoming hands. when the birds recover, and are ready to be released, they come back to Bondi, so they are in familiar surroundings and close to their original flock. To protect the birds the Centre is not open for public tours. The apple tree was here when my grandmother arrived in 1905. Ever since, we've been making applesauce and apple pies from the hard, tart green apples. And we've never found any other apples like them, in all that time. They are sharp, and truly only a cooking apple. Even the horses pucker up when they bite into these, but there are no better apples for making pies. We've tried to get the tree to propogate over the years, without a lot of success. Carol finally succeeded in getting several small trees to grow from apple seeds, and she is carefully nurturing them. Rebecca, from BarKNursery, came last year to try air-layering the tree. This involves making a cut in a healthy branch, and layering moss and a container around the cut to encourage root growth. Rebecca is an environmental horticulturalist, specializing in producing Native plants, planning Garden installation & site restoration,environmental consulting & education. 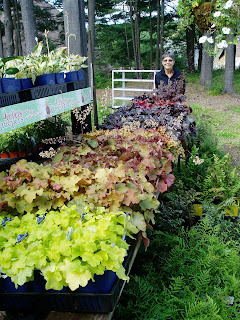 She's been here to offer a seminar to the Lake of Bays Association about Native plantings. 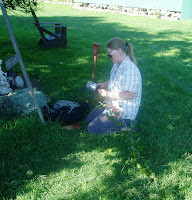 She was instrumental in the shoreline restoration project at Norway Point, Lake of Bays, and also in the shoreline work and native plants garden at the Historical Plaque for the Portage Flyer at South Portage. She's also done some work along our shoreline at Bondi, and gone home with large quantities of iris when Carol is dividing the gardens here. We're always delighted to see her. Rebecca's work always puts the environment first. Last week, one of the major branches of our apple tree split from the trunk, under the weight of the apples. Rebecca arrived to remove the air-layers, and hopefully (fingers crossed everyone!) they will thrive. She has also made the suggestion that Brian could bury the trunk with the branches protruding out of the ground, and it just might take root like that, putting up shoots of 'apple shrubs'. We'd take it..
We have plenty of apple trees on the property, including some wild ones scattered up around the back fields and in the most unlikely places, but this apple tree is very special to us, and we're doing everything we can to preserve it for the future. At this time of year, Carol's gardens are a blaze of colours. Sue has been coming to Bondi for over 30 years. She lives in Holland Landing, and her gardens have been recognized for their Curb Appeal by the local horticultural society. In short, Sue knows her flowers. She spends a lot of time when she's here tinkering in Carol's gardens, the pair of them discussing all those cool things gardeners talk about. Growing season, hardiness, flowering attributes...sun or shade, new colours... Sue simply loves gardening, and is seldom happier than when she's got her fingers in good soil. For Sue, no visit to Bondi is complete without stopping in at the Dwight Garden Centre. She says Linda has a better selection at this garden centre than any of the big centres close to her home base. And every trip, another plant goes home with Sue. And usually a few find their way here to us, because yes, we do agree Linda has an incredible selection. This selection of Coral Bells caught her eye at the Garden Centre. 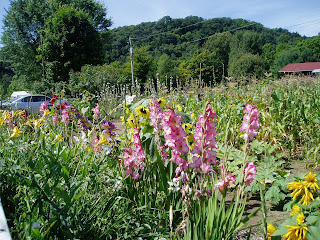 Then she helped collect seeds from the various colours of hollyhocks that are crowding along one side of the big garden. Labour Day has drawn 'official' summer to a close, but the lake is still 76 degrees F., as warm as it's been all summer, and the sun is hot. While most guests have to return to school and work scheduls, there are people who organize their time to take advantage of the quieter atmosphere that rolls in on Labour Day itself. That's what the old farmers (and my Dad!) used to call "eggs". The best part of the adventure, however, was taking the eggs he'd gathered back to the cottage to help make French Toast, and slather local made Maple Syrup all over it. Labour Day traditionally marks the end of Summer and the beginning of Fall. 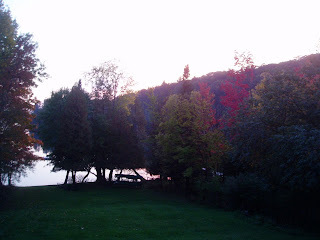 One of the most wonderful things about Muskoka is the changing of the seasons. From the crisp winter whites through the soft spring greens and sunbaked summers, the year moves on towards the autumn and the best display of colours on earth. We are just beginning to see the blush of red on some of the trees, but by mid-September we will be in the middle of the trees' great display of artwork. I remember showing photographs of Bondi to new friends I met on a safari in Kenya. Clustered around me by the campfire, the photographs eagerly passed from hand to hand until I thought I'd never see them again, there was much discussion, and a general consensus that "these are Not Trees, Mama, these must be Flowers." It was hard to convince them otherwise. The maples certainly can put on the colour red to equal any flower in Carol's gardens. Along with the golds and russet shades of the oaks and poplars, the forest really lights up. Some of the best hiking in the year is on offer come autumn, with the leaves underfoot, the colours overhead, the lakes their deepest blue. The hike to the top of the Lookout trail is rewarded with a panorama of colour. A drive down the country roads is like driving through an art gallery of the very best kind. Or just relax at the cottage, and enjoy the view. This photo is of Lantern cottage, taken looking back from the end of it's dock. And, yes, that tree could be a flower, it's so beautiful. All the same, herons are wondrous birds. It never fails to amaze me that they can get airborne, and stay there. Yet these big birds nest in treetops, and spend a lot of time in the air. We had a pair all summer hanging out in the bay at Bondi. They like to nest in colonies, and will migrate in small groups, but during the summer season we usually only see them alone or in a pair, fishing their way along our shallow beaches. This is the great blue heron, the largest of our herons. There are two 'approved' hunting methods: one is to stand motionless, neck extended at an angle of about 45 degrees to the water’s surface, moving only the head and eyes. After a few minutes, the heron gradually moves a short distance away and takes up a similar position. When dinner arrives, the heron slowly folds its neck back and moves one leg in the direction of the prey. Suddenly, its entire body unbends, its head plunges into the water like a javelin, it catches the prey in its bill, and it swallows it outside the water. Fish must be lined up correctly to be swallowed, so sometimes the heron will 'drop' the fish several times, snapping at it, until it is properly aligned. The second hunting method is the "promenade" -- the heron slowly wades around in about 15 to 25 cm of water until it drives a fish out from a hiding place. The heron then stops and slowly stretches its neck. When the prey is within range, the bird uncoils its body and thrusts its head into the water in pursuit. When it has eaten the catch, the heron resumes its walk. Ed and Cathy, paddling stealthily along the shore in the morning with their canoe, sent me this fabulous photograph. Nature always gives you a gift when you get up early and get out there... being this close to one of the 'siegemasters' is a great gift. Being as handy as Ed is with a camera doesn't hurt either!